The Droplet Junction Chip (190 µm etch depth) is a glass microfluidic device designed for generating droplets. The channels on the chip have a fluorophilic surface coating. The Quartz Droplet Junction Chip is a microfluidic device designed for generating droplets. The Quartz Droplet Junction Chip offers both a T- and X-Junction. Applications include monodispersed droplet formation and emulsion formation. The Quartz Droplet Junction Chip 190 µm is a microfluidic device designed for generating droplets. The Quartz Droplet Junction Chip offers both a T- and X-Junction. Applications include monodispersed droplet formation and emulsion formation. The Droplet Junction Chip is a glass microfluidic device designed for generating droplets. 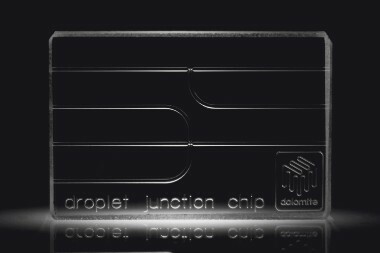 The Droplet Junction Chip offers both a T- and X-Junction. Applications include monodispersed droplet formation and emulsion formation. The Droplet Junction Chip with header is a glass microfluidic device designed for generating droplets. 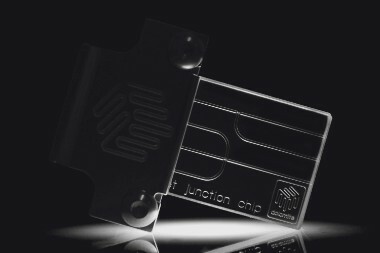 The Droplet Junction Chip is available with attached header for ejection of droplets into a bulk liquid. This is useful for generation of emulsions since it reduces the likelihood of droplet coalescence, which can be an issue with some fluids on transfer from chip to tubing. In this configuration, the Droplet Junction Chip with Header is used with the Linear Connector 4-way to generate droplets on the X-junction and eject from the edge of the chip. Droplets can be collected using the Droplet Collection Module. An additional benefit of this collection method is that droplets can be cured with UV light immediately after generation. Top layer or base layer left un-etched to create a semi-circular channel cross-section. Top layer and/or base layer etched to different depths. Dolomite is a licensee of Japan Science and Technology Agency ("JST") under JST's microdroplet generation technology. This enables our customers to purchase and use this droplet chip for R&D purposes without any restriction from this comprehensive IP family.